Do you need your uPVC Door Repaired, Replaced or even a new one installed? We specialise in repairing and replacing 99% of uPVC doors in 99% of homes in Dublin and surrounding counties. There are plenty of possible issues which may cause your uPVC door to be repaired or replaced and we are the experts to help you! uPVC door is commonly found in domestic homes for front and back doors. It is quite cheaper compared to composite doors; however, it also has common defects and problems. The key sometimes does not go inside and sometimes it will not even turn. Usually, if this problem occurs, the lock cylinder needs to be replaced. The common reason behind this is the lock is already worn, or it is a low-quality type of lock, making it out of sync. There are also cases where the PVC door will not close because its latch part is not adjusted correctly and some faulty mechanism is the door rubber is not sitting properly to stop the door from closing. If this problem occurs, there is one reliable company you can rely on. 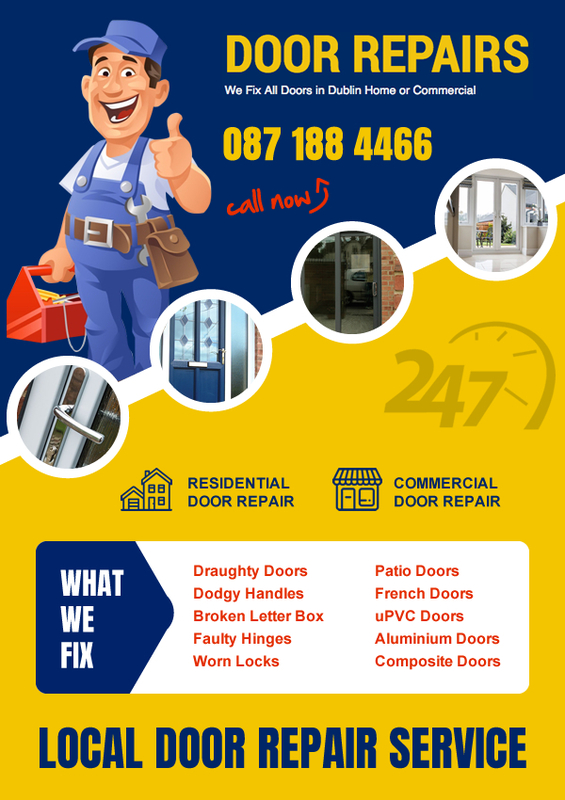 Door Repair Dublin provides a variety of services for all kind of door repairs. Why spend money replacing the whole door when you can easily have it repaired? Having a high-quality material for door parts is very important if you want to get a full security for your household. They also produce the high-security anti-snap locks to provide you the best among other locks sold in the market. Aside from these, we also specialise in lock repair which is the vital need of a household to obtain safety and security. We ONLY offer and install anti-snap locks to ensure you have a peace of mind even if you are far away from home. We also fix letterboxes and make sure burglars cannot use it to access your home. You can rely on them in everything where security matters most and a quality work performance is involved. uPVC doors hanging on for dear life!